The iBeacon, Apple's tool for tracking users in stores to personalise their shopping experience, is no longer the only such solution on the market. Semiconductor giant Qualcomm has released a new rival sensor called Gimbal Proximity. At a price of $5 (£3, AU$5), the concept of the sensor is similar to the iBeacon in that it tracks the in-store location of customers accurately. Use of the platform promises to allow brands to increase sales and drive loyalty by delivering relevant and targeted messages while their consumers are physically in the store. "With the availability of Gimbal proximity beacons, we are empowering brands to take mobile engagement with their customers to a whole new level through micro-location," said Rocco Fabiano, president of Qualcomm Retail Solutions. Using the sensor, retailers would know what area of the store customers are in, and can then tailor adverts, information and special offers towards those people. Two Gimbal sensors are available, the Series 10 and the larger Series 20, both of which use low-energy Bluetooth Smart technology, which is said to be accurate to within a foot. 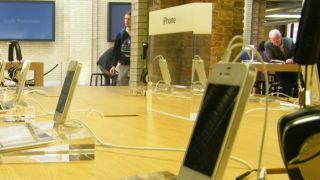 These can be be placed throughout any brick-and-mortar store without loss of connectivity. Qualcomm's Gimbal combines "physical location, activity, time and personal interests" and is available for iOS devices with support for Android coming later. It is versatile enough to be used in many other ways. Interaction for marketing purposes, as an early demo of the Gimbal showed with the Star Trek film franchise, is also a possibility. They would allow consumers to complete actions and tasks to reward them with special offers and increase their loyalty to the brand. Using Bluetooth Smart technology gives the Gimbal an easier mode of connection, with GPS and NFC both having drawbacks in usability. Rather than using the cloud, the Gimbal Beacon processes the data received within its device, making the interface and interaction at a customer level, far faster.